Registration for this year’s event has closed. As parents of a child with special needs, we have often been disappointed that we cannot participate in simple community activities like Easter egg hunts, fall festivals or visits with Santa. Too often, the challenges of navigating these events are far greater than the positives. Several years ago, we took our daughter, Ava, to an Easter egg hunt where she only managed to get two eggs. She didn’t understand what was happening or what the expectation was while all the other kids and parents stared. It was awful. We longed for the chance for Ava where she, and other kids with special needs, could enjoy themselves at their own pace without judgment or scrutiny, and where parents can relax and focus on spending quality time with their children. Instead of waiting for this opportunity to come to us, we decided to create it ourselves. 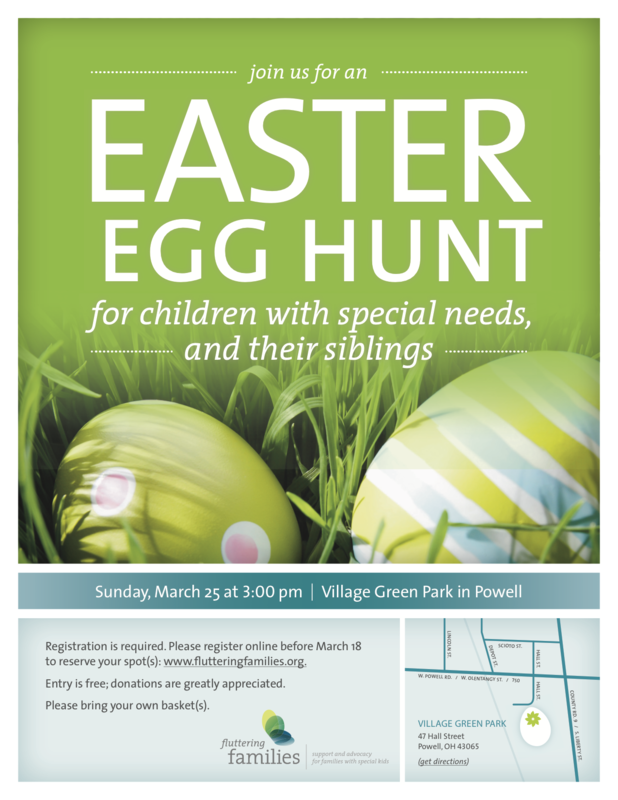 The Fluttering Families Easter Egg Hunt gives our special kids, and their siblings, the opportunity to hunt for eggs, while providing a supportive and empathic environment for their parents. Our families deserve to participate in the same rites of passage as families with typically-developing kids. 1) Every kid gets the same number of eggs. Enough said. 2) All of the eggs contain inedible items (no candy! no food!) to help manage the stress of having a child with dietary restrictions. 3) You can be you. Your kids can be your kids. You can all be together. This year’s hunt is on Sunday, March 25 at 3:00pm at Village Green Park (47 Hall St., Powell, OH 43065). Download & Print/Share the Flyer!